Russian scientists have made a breakthrough in domestic medicine and have offered surgeons a unique development - product capable of making even the most complex surgical operations more sparing and less invasive. The new medical invention - the fibrin-thrombin sealant (FS) CRYOFIT™ - proved to be highly effective, completely safe and simple enough for use. Clinical surgery has long needed an import-substituting sealant that can positively influence hemostasis, allow seamless operations to be performed, reduce operating time and trigger natural regeneration of tissues and proliferation of cells. Today the task set for Russian scientists to develop such product is fulfilled. 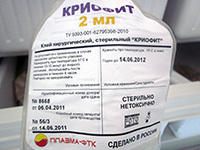 Unlike many foreign analogues the Russian fibrin-thrombin adhesive, created by PLAZMA-FTK, does not have synthetic components, demonstrates the best properties and is substantially cheaper. New goals are set for further improvement of our medical product with the aim to promote our sealant to different surgical specializations. Fibrin glue CRYOFIT™ brought Russian medicine to a new level. More than 32 million rubles have been invested in the project so far. In 2009, research began on fibrin-thrombin technology. In 2012, in Zelenograd, the production of the sealant was launched. In 2016, CRYOFIT™ entered the Russian market. Our website contains detailed information about fibrin-thrombin glue CRYOFIT™. To ask a question or to buy our medical glue use the interactive form. To get acquainted with the information on cooperation, or to become a partner, please, use the "Cooperation" section. Fibrin-thrombin sealant creates a positive environment for the attachment, differentiation and survival of transplanted cells and excludes the possibility of their uncontrolled migration. It allowed orthopedic surgeons to significantly expand the possibilities in the treatment of patients. That, in turn, gave momentum to Russian medicine within the framework of this specialization. Working on the patent "Method of restoration of defects of hyaline cartilage of articular surfaces of joints of extremities", its authors Plaekseychuk Yu. A., Masgutov R.F. and other specialists used fibrin glue to restore the function of large joints. The essence of their method was: first, some fat tissue was taken from the patient via liposuction, then cells of the stromal-vascular fraction were extracted from the biomaterial. The arthromy of the damaged joint was carried out and the resulting SVF cells were introduced into the periphery of the defective cartilage tissue together with the fibrin sealant. The final stage of the operation consisted of the performance of 8 flexion-extensor movements after 5 minutes from the procedure. Then the wound was stitched. The procedure was performed via the duploject system, which allowed for the simultaneous introduction of SVF cells and fibrin glue. PLAZMA-FTK LLC continued its progress . In cooperation with the Roberts Helskear LLC, the negotiations were held with the manufacturer of collagen gel from South Korea. The gel is used for fixing during orthopedic operations aimed at eliminating articular defects, its purpose is to initiate the process of regeneration of cartilaginous tissue. The surgeons use fibrin glue to fix the collagen gel. This technique is of undoubted interest for Russian medicine. Thus, it was decided to transfer the CRYOFIT™ glue to our Korean partners. The method will continue to be perfected and subsequently it will be introduced to the Russian domestic medical practice. Fibrin-thrombin sealant CRYOFIT™ demonstrated reliable adhesive qualities and promoted regenerative processes, which underlines its numerous advantages. Given that the glue can be produced from autologous material its importance in treating patients is quite significant. Plastic surgeons were among the first who showed interest in fibrin-thrombin glue. Seamless plastic is a dream of all specialists in this surgical industry. CRYOFIT™ medical glue is certified, patented and recommended in all health facilities and private clinics in the territory of the Russian Federation. Produced since 2012. I agree to the processing my personal data in accordance with the Russian Federal Law No.152 "On Personal Data"